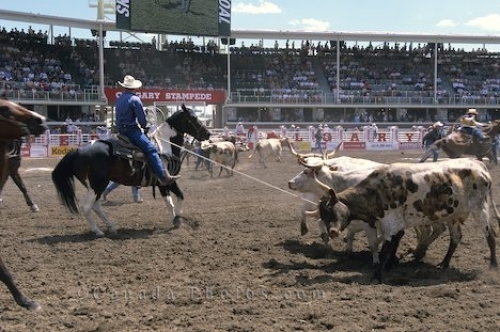 Steer wrestling is one of the main events that take place each year at the Calgary Stampede in Alberta, Canada. Thousands of people attend the annual steer wrestling events at the Calgary Stampede in Calgary, Alberta which are very physically demanding for the riders but very exciting for the audience to watch. Steer wrestling is an event that is timed and the fastest competitor completing the event properly with the best time will result in being the winner. Please let me show you more of my pictures from my "photo gallery: Calgary City Photos". Picture of cowboys on their horses as the steer wrestling events are well underway at the Calgary Stampede in Alberta, Canada. Pictures from photo gallery "Calgary City Photos"